We had been discussing going camping for years. A couple of years ago a friend of ours gave us a brand new Halfords tent bag, which included a tent, sleeping bags, lights and airbeds. Summer that year came and went and we did not go, we didn’t go last year either, but this year I was determined to add a bit more adventure to our life and we set out to go on our first camping weekend. 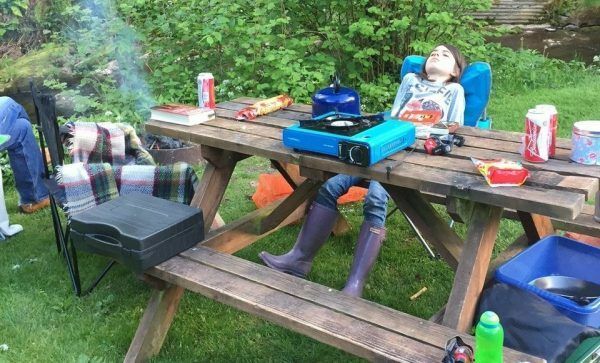 We were determined not to spend too much money buying things that we might never use again, so I only invested in a little Camping Gaz cooker (£12) and a good quality airbed (£45). I knew that even if we did not like camping, we would use both things again for other purposes. We had the tent and we have a lot of friends who camp or used to camp so we begged and borrowed: chairs, lamps, cooking pots, sleeping bags and other little tidbits. We were sorted with everything we thought we’d need within a few days. Another part of the camping plan that we felt was crucial for us was that we did not venture too far so we could come home if the weather got too adverse or if anyone could not bear camping. 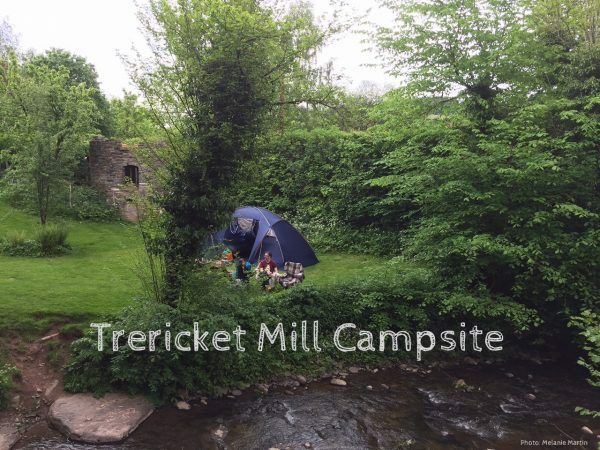 We set our sights on Trericket Mill in the Brecon Beacons since it’s just over an hour from Birmingham. Now there was only the last bit of planning left to do: Trying to pitch the tent in preparation so we knew it was complete and also to make sure that we could actually do it. An empty plot on our allotment site was perfect for it, so with some interested onlookers, we did a trial run. It was a good job we did this as it was more complicated than the tents of my youth. Our car looked ridiculous – completely over stuffed – as we packed a ton of blankets as the nights were still chilly then. My husband did not believe that everything would fit into our Chevrolet estate, but in the end I managed to pack everything I wanted to take. I admit to feeling a bit ridiculous but as I went through my list, I could not really think what to do without. Once we arrived at the campsite I was thankful that I had remembered to pack the tent in such a way that it was the first thing to come out of the car. We went on Whitsun and arrived at the campsite just gone midday on the Saturday. 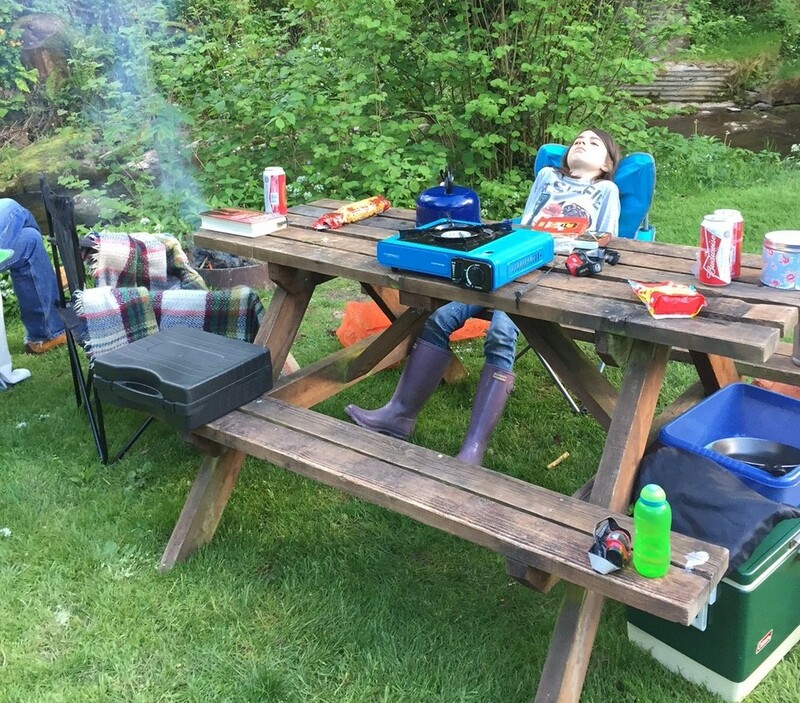 It turned out – lucky for us – that the campsite was just perfect: It was small, the owners were friendly and it was quiet (well there is an A road nearby but that did not bother us). The tent was pitched within half an hour and without any bickering – praise be the trial run! As we unpacked the car over the course of the afternoon our 8 year old daughter took to the camping site immediately. Much of that first afternoon she spent in the stream, and following the chicken and ducks around the lawn. By the time we served supper she was covered in mud and that, to me, is really what it is all about. As for meals, we kept it simple, since we were only gone for a couple of nights. Tomato soup and bread or eggs, beans, veggie sausage and bread. The campsite offered cooked breakfasts (vegetarian ones) but we opted for a cup of coffee and bread instead. I had forgotten how wonderful coffee tastes after a night in a tent. Also note to self: if you want to eat cereal in the morning, take a bowl. And actually taking the cereal might help as well. I am so glad that I read on “GET OUT WITH THE KIDS” how to set up the sleeping arrangements: The second night temperatures fell to about 3 Celcius, but thanks to all the blankets, we were cosy and snug. The area around the campsite in the Brecon Beacons is magical and we went for a walk in waterfall country, but overall we just enjoyed the campsite so much that we read, talked and made campfires. And retired early: As soon as the sun went down it was freezing cold, even with plenty of layers of clothing. It will be a while yet before we can call ourselves “campers” but we will definitely go again. We realised that the tent we got – although it is not a bad one – is just a little bit too small for us, so we will be looking for a different one in the sales. Don’t aim to get it all perfect first time round. We could have done things different, certainly in terms of packing and instead of taking thick blankets, taking more effective fleece ones, which are thinner and take up less space. Still, it was a fab weekend with all its imperfections. Melanie is a German living in the UK. Having grown up in a small village in the South of Germany, she now lives in Birmingham, the UK's second largest city and tries to escape her urban surroundings as much as possible, dragging her family out to the countryside and dreaming of one day living in a remote location. Until then the local park will have to do. Melanie is on a mission to rekindle a sense of adventure in her life and has started a blog on her small and bigger adventures. When she is not out adventuring, she likes to read, cook and garden a bit.